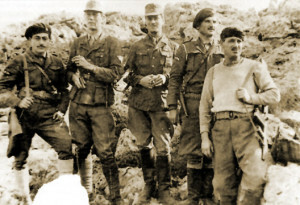 The saboteurs and stars of Natural Born Heroes: (left to right): George Tyrakis, Stanley Moss, Leigh Fermor, Manolis Paterakis and Leonidas Papaleonidas. Back before World War I, a French navy officer named Georges Hébert was present at the eruption of Mount Pelée on the island of Martinique. There, he witnessed the disaster and what he considered too much needless death due to the accident. And it had nothing to do with early-warning systems, geological science, or anything like that. The problem he saw was that most of the people living there were entirely unable to take care of themselves and their loved ones physically. They couldn’t climb over obstacles, or carry the wounded to safety, or even function to see ways out of the disaster because they’d been bound by civilization for too long. They’d had their natural strength and instinct civilized out of them. To solve this problem, Hébert created Méthode Naturelle, a system of recreating the natural strength and movement ability that humans had in their pre-civilized past and could regain today. His motto became: “Être fort pour être utile” (“Being strong to be useful”). His success at recreating men was disastrously cut short by the trenches, artillery, and machine guns of the First World War, but the idea was picked up by a number of people including Erwan Le Corre. Le Corre, naturally (pun unintended), is the founder of MovNat – a new system of movement that is taking the world by storm and helping many people to reclaim health they didn’t even know was possible. Natural Born Heroes: How a Daring Band of Misfits Mastered the Lost Secrets of Strength and Endurance is the latest book by Christopher McDougall, and within its pages McDougall does for natural fitness and nutrition what he did for barefoot and ultra running in his previous book, Born to Run: A Hidden Tribe, Superathletes, and the Greatest Race the World Has Never Seen . McDougall’s topic for Natural Born Heroes travels across the sea to the island of Crete, which is the largest Greek island just south of its mainland. The terrain of Crete is mountainous and challenging, and many of the people there have been untouched to a great extent by a lot of modern living. It’s a perfect training ground for the event that McDougall’s book discusses: the Axis invasion of Crete during World War II. The big topic of the book is how a group of unconventional British agents and their Cretan cohorts were able to kidnap a top Nazi general and whisk him off the island under the noses of the Nazi occupation. But in now-typical McDougall fashion, the topic isn’t simply the history of the event. Natural Born Heroes is an absolute primer on what we, as modern humans, can do to make ourselves stronger, more resilient, and, most importantly, helpful to our fellow man. The author explores the history and myth of the Greek Heroes and how their mindset made them different than other heroes around the world. He takes a look at famous Greek stories like The Iliad and The Odyssey by Homer, and shows how they can be used to learn more about the men in those books just as archaeologist Heinrich Schliemann used them to discover the actual sites of Troy, Mycenae, and Ithaca from Homer’s novels. He explores the worlds of natural movement and how fitness went awry with the advent of the bodybuilding craze in the early 80s. He looks at (and tries for himself) methods like Parkour and MovNat, and shows not only how they improve the body but also change the perception of the practicers by opening up the world around them to more movement possibilities. He looks at the physical training style of ancient warriors and their modern athletic counterparts who are discovering that less effort can actually equal more results. He talks about the Cretan food and how by using a lower-carbohydrate and higher fat load, the Cretans and their British counterparts were able to reset their epigenetics to allow their bodies to fuel the fire with body fat instead of a constant carbohydrate intake – and how that’s a more natural way to fuel. And what’s most important, he highlights some of the people who are driving these rediscoveries and takes the time to try out the fruits of their labor. He learns Parkour. He learns MovNat. He changes his food plan and his training style to match some of the suggestions from antiquity that have been reintroduced by forward thinkers in today’s world. And the result is amazing. Natural Born Heroes is exciting, illuminating, and a rollicking adventure that may just change a lot of the way that people look at their movement, diet, and perceptions of the world. He not only draws you in to the characters in the book and the story of the British spies and Cretan guerrillas who fought the Nazis, but the people who are rediscovering the “lost secrets” of the past in the modern world. In all honesty, it’s like someone picked out a book that would precisely fascinate me and wrote it for everyone. There is so much that one can take away from this book that it’s hard to know where to begin. One almost feels cheated by the modern world that has taken away the potential for strength and health that used to exist in the human body when reading about these amazing people and the work they used to be able to do. But I think the real message that McDougall gets across most functionally with Natural Born Heroes is that it is possible to regain that strength and health, and most importantly the ability to be that useful creature that is capable of helping the world around him or her. We can become that person who would be able to act to save their family during a volcano or other disaster. And we can keep those traditions alive by continually passing on these traditions that have been painstakingly relearned.